The Coalition of Resistance is calling a People's Assembly. It is clear the country has had enough of the far right Tory and Liberal Democrat coalition and their attacks on working people, poor and vulnerable and their protecting and cushioning of those who wrecked the UK economy. These millionaires and billionaires who control our Government at the moment do-not speak for me nor as voting patterns show, do they speak for Scotland. I support the call for a united resistance by the Coalition of Resistance (a funny, but informative blog about the call for a People's Assembly by Mark Steel can be found HERE). 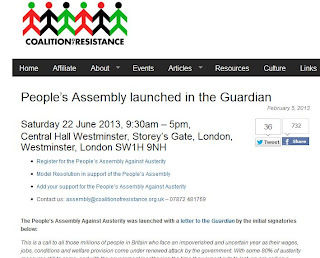 Ordinary people across the country will attend this People's Assembly. I propose East Dunbartonshire people who are not only fed up with Westminster right wing policy makers attacking Scottish citizens who never voted for it, but also people who have been diversely affected by these greedy, unrepresentative people should meet and plan resistance here. I propose a campaign that will lobby our local Liberal Democrat MP (and Westminster Cabinet member), MSP's who support the Westminster Government and Councillors who will not propose alternative defiance budgets. I propose we lobby the Yes campaign and the Better Together campaign and as, in their vision of a post 2014 Scotland, how they are going to protect us from policy Scotland has never voted for?